Weeknight dinners can be tough. Some days, just a full day in the office is enough to do me in. For the past three months, I've been training for the Cherry Blossom 10-miler , which has left me with even less time for cooking. I followed a specific training program, so at first, the runs were pretty short and could be accomplished in the morning before work. As training progressed, the runs got longer, and, not being a morning person, I started fitting in my runs after work. On Monday, I ran my last long run before the race and logged a whopping 8 miles. Not much to some, but it was a new personal record for me and I couldn't have been more pumped! As I've plodded along through my training, I've found myself making avocado egg toast at least once a week. It's super easy to buy avocados when they're on sale and store them in the fridge once they're ripe (they last 3-5 days in the fridge). It even makes a great breakfast too! 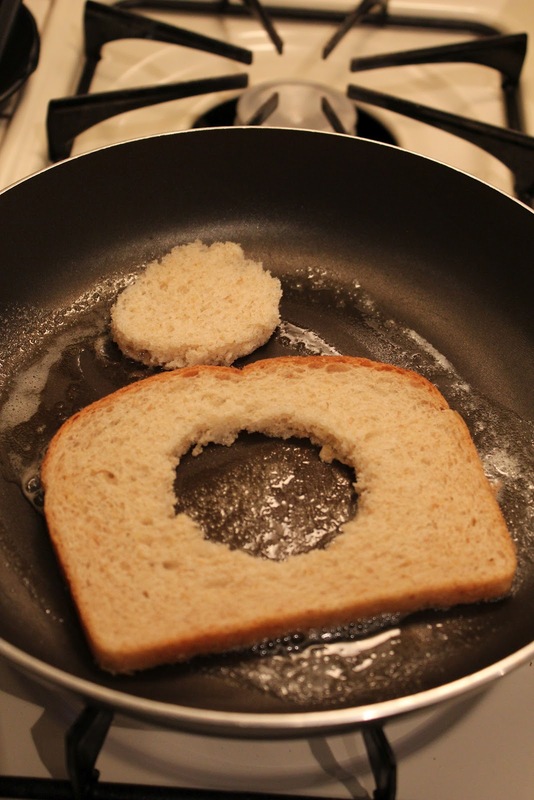 First, cut a circle out of the bread. I prefer to use a knife, but you can also use a drinking glass or biscuit cutter to form a more perfect circle. Melt 1/2 a tablespoon of butter in a medium pan over medium-high heat and place the bread in the pan. Crack the egg directly into the hole and sprinkle with salt and pepper. Cook for about 2-3 minutes or until the underside is golden brown. If you like your yolk running (a runny yolk really is delicious here, but if you're not a runny yolk person, I get it), cook it over heat that is a bit higher. This way, the bread will toast more quickly without cooking the inside of the egg as much. Add the additional 1/2 tablespoon of butter, flip, and cook on the other side. While the bread and egg are cooking, prepare the avocado. Slice it in half and scoop the flesh from one half, saving the half with the pit for another night. Mash the avocado in a bowl with a fork and set aside. When the bread is golden brown on both sides, remove to a plate. Top with the mashed avocado and sprinkle with salt and pepper to taste. Serve with a green salad and fruit and enjoy immediately. An asy weeknight dinner, this dish is ready in under ten minutes and yields minimal cleanup. Serve with greens and some fruit for a well balanced, delicious meal. Over medium high heat, melt 1/2 tablespoon of butter in a medium frying pan. 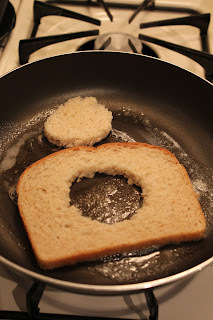 While butter is melting, cut a hole in the center of the bread with a knife, biscuit cutter, or glass. Place bread in the frying pan and crack the egg into the hole. Sprinkle with salt and pepper. Cook for 2-3 minutes, or until golden brown. Add additional 1/2 tablespoon butter and turn both pieces of bread. Cook for an additional 2-3 minutes. While egg and bread are cooking, slice the avocado in half. Scoop the flesh from one half of the avocado and mash in a bowl. When the egg is cooked and bread toasted to a golden brown, remove to a plate. Spread the mashed avocado over the egg and sprinkle with additional salt and pepper. Serve immediately. Hmmm....I've always loved avocado toast, but have never tried it with an egg. Perhaps, perhaps!